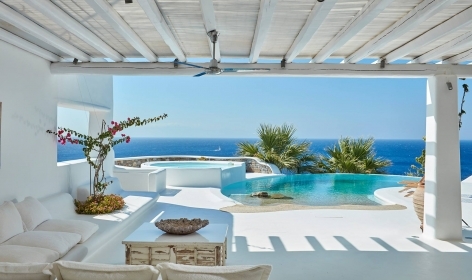 The extravagant and irresistible Mykonos, in the Cyclades archipelago, is particularly popular among crowds looking for a nonstop party atmosphere. But it's not all about thumping music. Check out the fifteen best hotels to unwind and sleep-in. Mykonos has changed a lot since its days as a quaint fishing village. 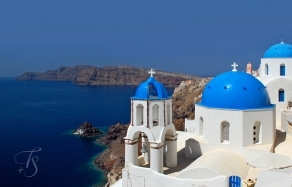 These days the island’s traditional Greek charms are as much embraced as they are augmented by modern attractions and sights. 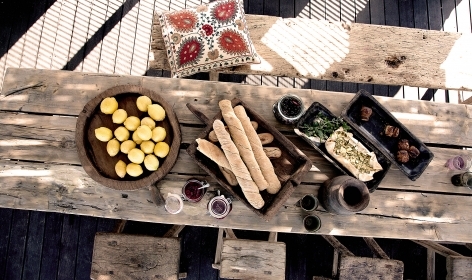 Traditional al fresco tavernas dot every square and waterfront of Mykonos. The streets here are lined with galleries and boutiques. And all that seems encased in crisp white architecture and adorned with bright blue, yellow and red doors, windows and railings. Add to this some of the best clubs in the country, attracting renowned DJs and fashionistas—and you get a true holiday hotspot. 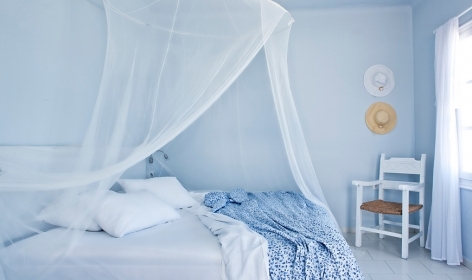 But only the most discerning visitors will fully appreciate the best stays on the island. 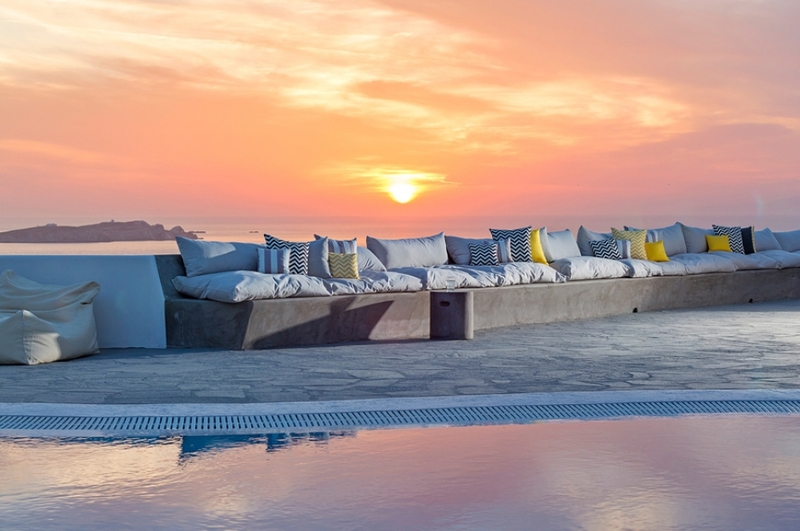 Ticking off the boxes for ambience, wow factor, the style and the service, we’ve settled on fifteen properties that make the ultimate list of Mykonos’ smartest hotels. 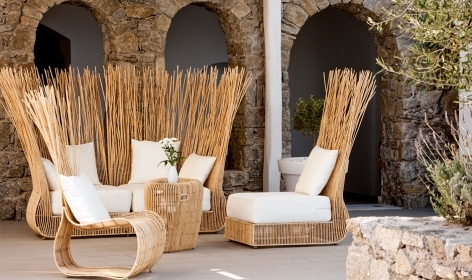 San Giorgio is designed with simplicity, freedom and fun. 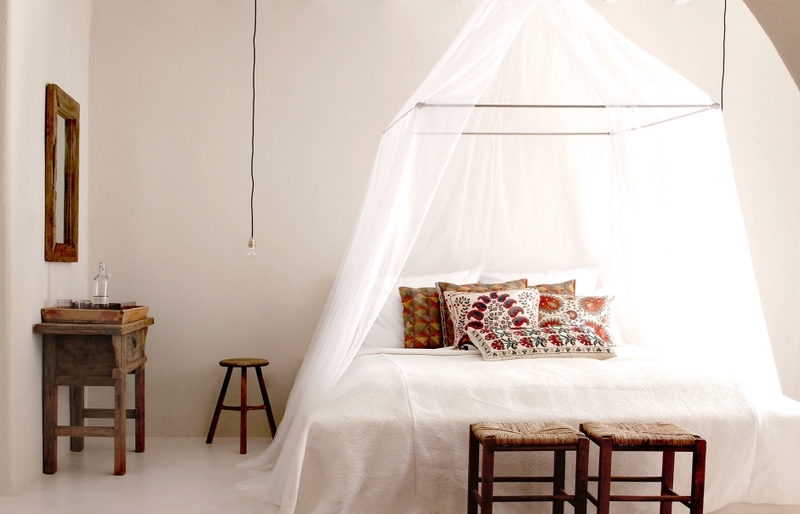 It blends the carefree vibe of the bohemian ‘60s with a down-to-earth gypset approach. 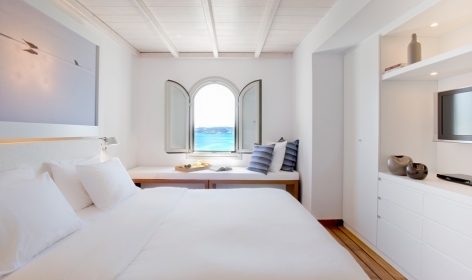 This results in a mix of rustic charm and modern Mediterranean style, with a touch of Moroccan flavour—making San Giorgio one of the most beautifully decorated boutique hotels in Mykonos. 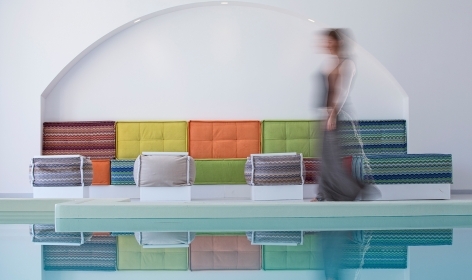 We love it for: Firstly, the hotel feels like a summer home of your coolest friend. 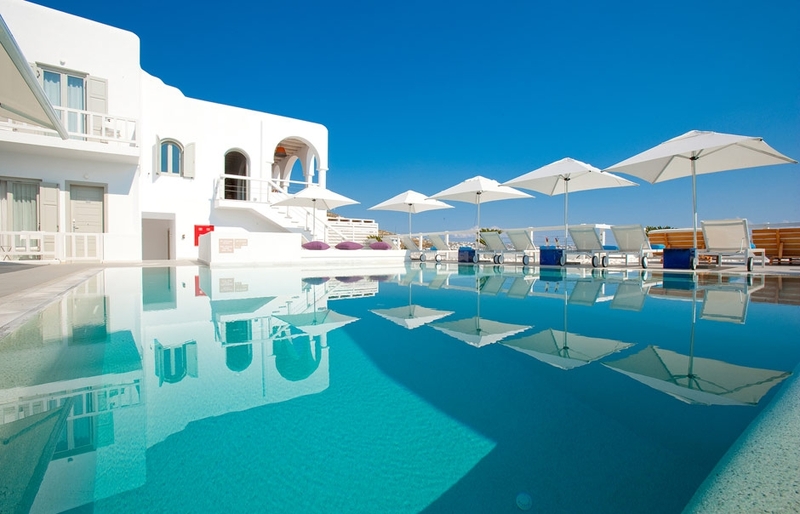 Secondly, you get a VIP access to the world-famous Paradise Club, and to the Scorpios Mykonos beach hangout. 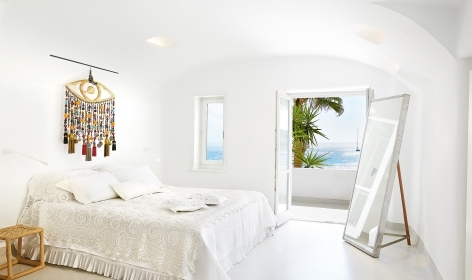 Read our review: San Giorgio Mykonos, Greece. Make a reservation: Book via Tablet Hotels. 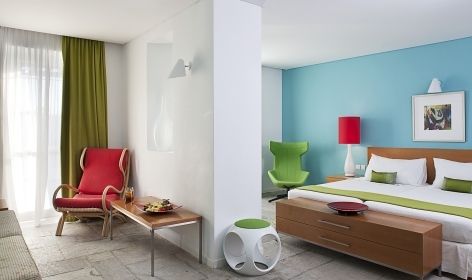 Mix cosmopolitan sophistication with barefoot island chic, and you get a hotel that is almost a work of art. 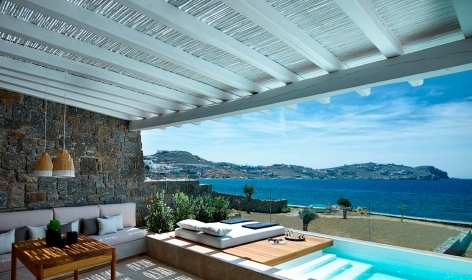 Yet Cavo Tagoo is designed not to overwhelm the eye but simply to be worthy of the beautiful Mykonos views. 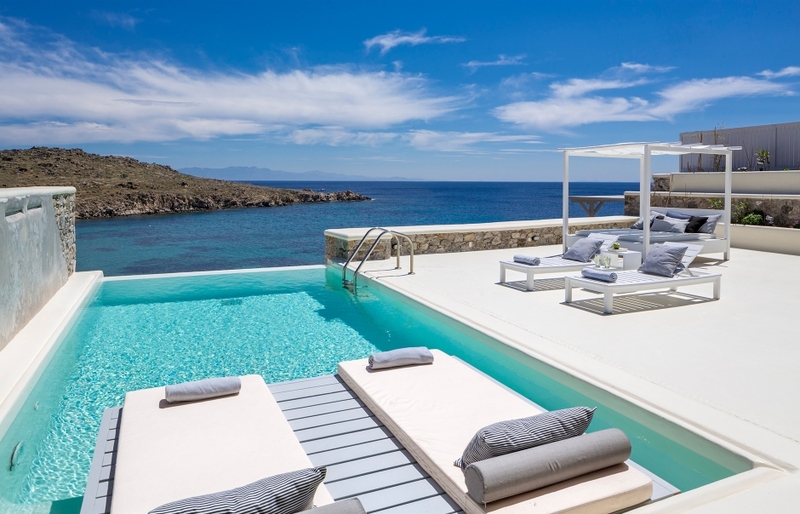 We love it for: With contemporary, minimalist interiors Cavo Tagoo is a refined getaway for a discerning traveller—and one of the finest boutique hotels in Mykonos. 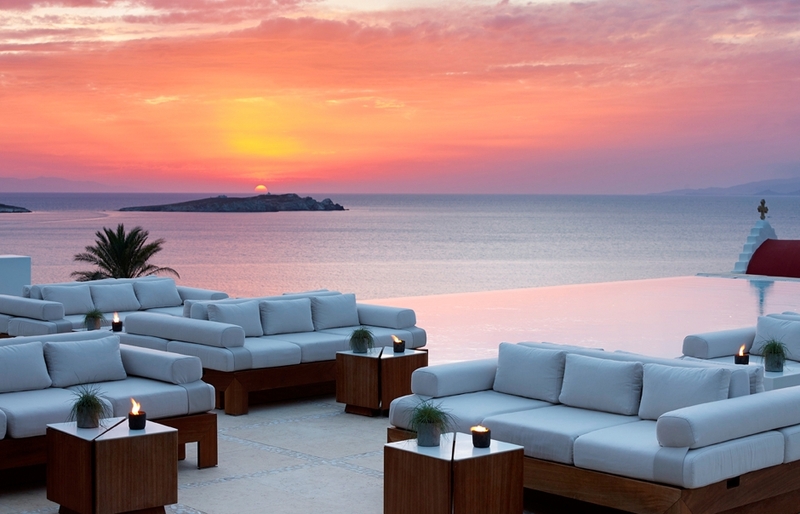 Read our review: Cavo Tagoo, Mykonos, Greece. 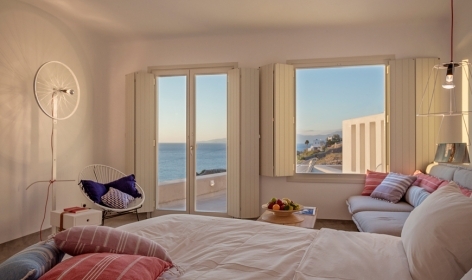 Since our stay at the Bill & Coo Mykonos Suites, the hotel expanded with Coast Suites, creating more opportunities to adore its serene atmosphere, minimal decor—and amazing sunsets. This effortlessly beautiful, Mediterranean-chic boutique hotel is a great hangout for fashionable travellers or couples on a romantic weekend trip. 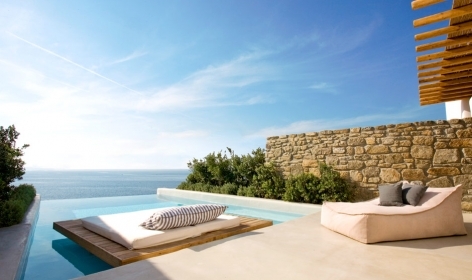 We love it for: The hotel’s infinity pool. It’s a glorious setting for the genuine magic of Cycladean sunsets. 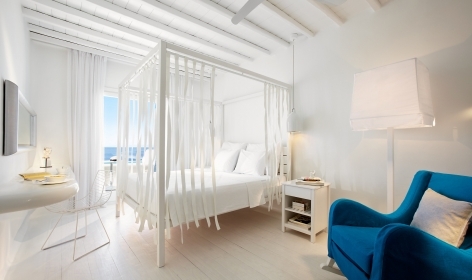 Read our review: Bill & Coo Mykonos, Greece. Make a reservation: Book via Kiwi Collection. 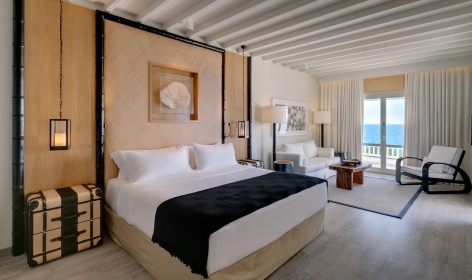 A state-of-the-art, elegant design with minimalist touch defines this luxurious boutique retreat. 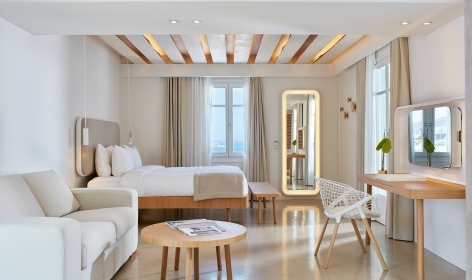 Stylish and tranquil, Kirini promises an idyllic Myconian experience. 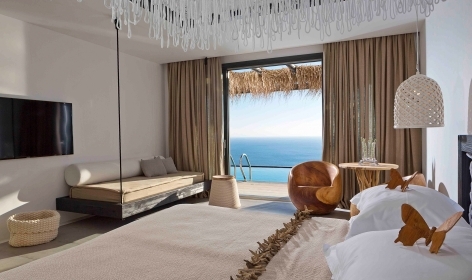 We love it for: The hotel’s luxurious “A.SPA” is listed among the best on the island—it’s a must try. Think Zen. Think Wow. If there is one place that ensures an almost spiritual experience it has to be Kenshō. The hotel goes for the highest hospitality standards while embracing fine art and design in its quest to “awake the senses”. We love it for: The aesthetics are but one facet of the hotel experience, but the astonishingly beautiful interiors alone place Kenshō in its own league. 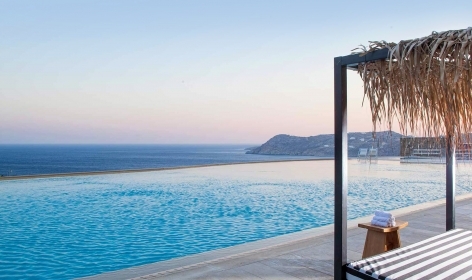 Great location and spectacular views of Mykonos and its picturesque harbour, as well as excellent restaurant and bar, and a long list of famous guests are only a few qualities that make Belvedere an icon of the hedonistic Mykonos. But the hotel also exudes elegance, charm and style. This beautiful place invites to hang out and relax with plenty of sunny terraces, cosy alcoves and airy places. 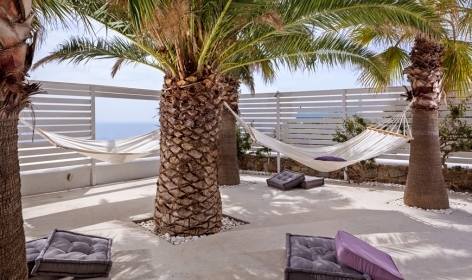 We love it for: The hotel is situated right in the centre of the town, just 5 minutes walk from Matoyanni (the most cosmopolitan street of Mykonos), full of bars, restaurants and boutiques. 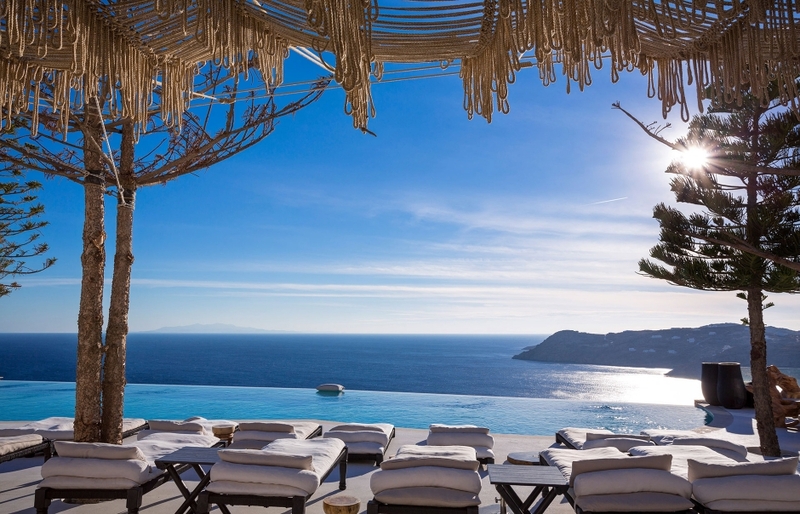 Read our review: Belvedere Mykonos, Greece. 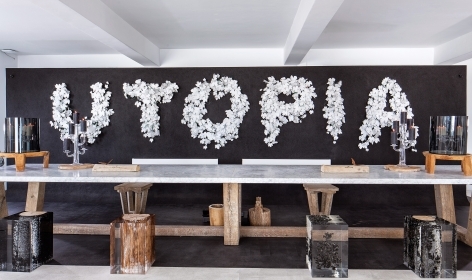 This hotel got our attention with its offbeat but sleek ‘boho’ style. Boheme’s architectural nods to the local building traditions, designer furniture and retro lighting create relaxing spaces with a strong contemporary aesthetic. 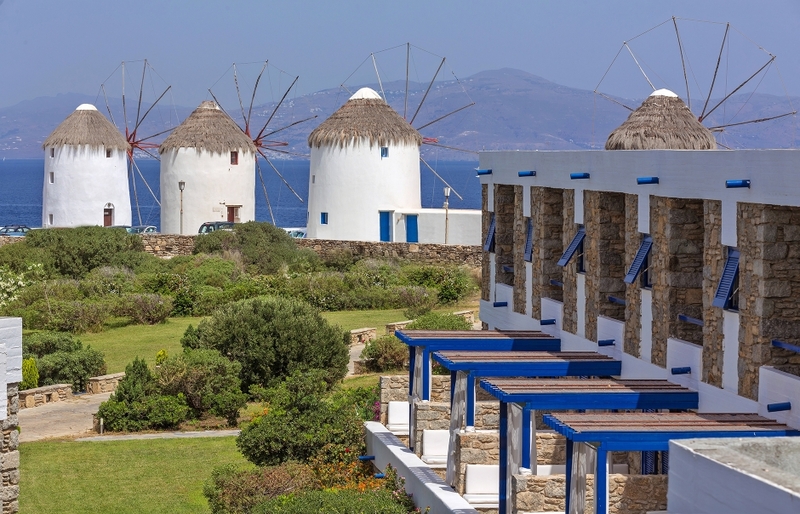 We love it for: The hotel captures character of the island in its light, airy spaces and great interior design—of which one standout feature are large fans reminiscent of the Mykonos’ famous windmills. 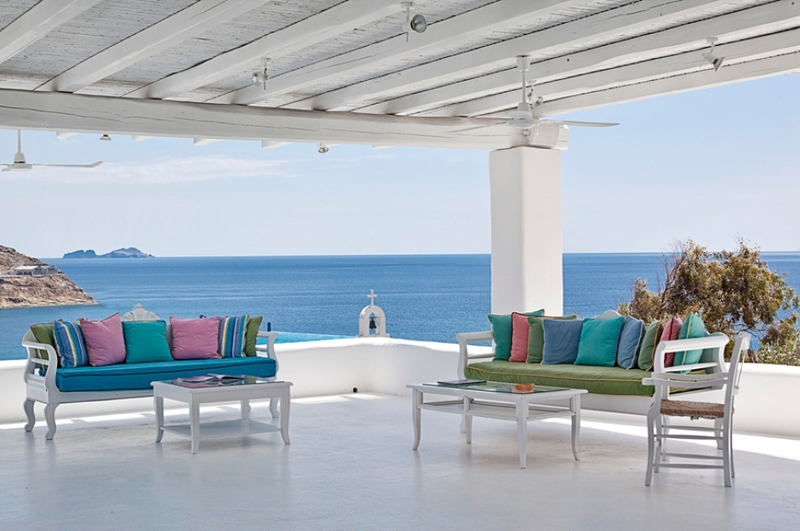 Read more: Converging at Boheme, finding Mykonos. Located near Paradise Beach in Psarou, this hotel is larger than others on this list and will appeal particularly to families. It offers several types of accommodation, three restaurants, a well-rounded spa with sauna as well as fitness centre and a lovely swimming pool. We love it for: The best thing is that Blu ticks all the right boxes for a beautiful luxury retreat. We love its sophisticated design and idyllic atmosphere. 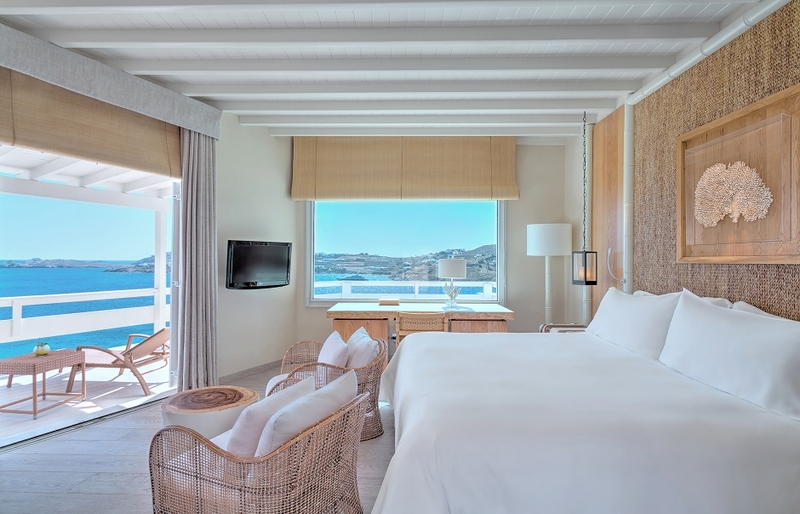 Overlooking a quiet cove with views over the Aegean Sea and Delos Island, oozing understated elegance in a décor of uncluttered contemporary style and whitewashed walls, Grace Mykonos stands as one of the coolest hangouts on the island. We love it for: Champagne breakfasts—with croissants dipped in melted chocolate, creamy Greek yoghurts and local honey. Oh yes, please! 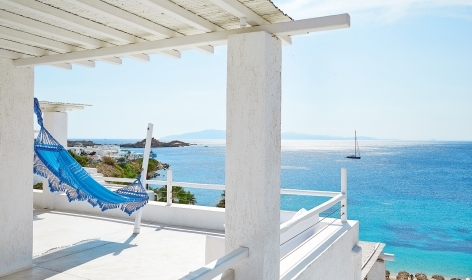 Read our review: Grace Mykonos, Greece. This is a unique offering ensuring another level of hospitality experience. 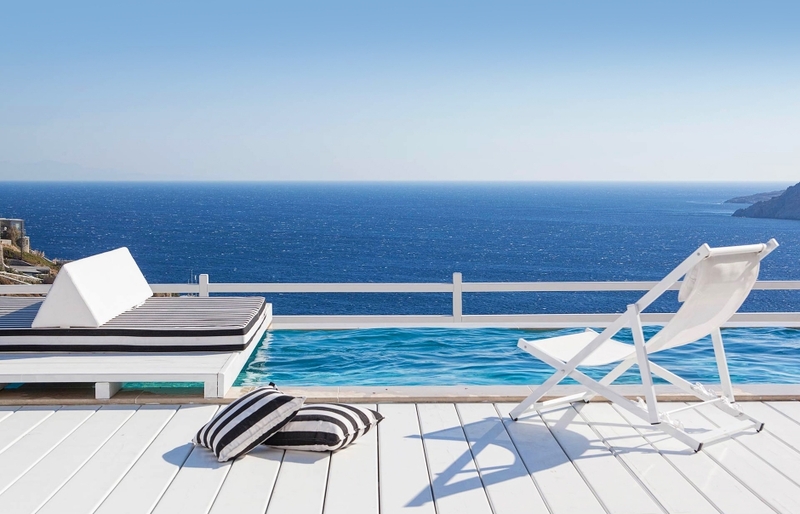 From a reasonably-sized two-bedroom villa to a whopping 33-bedroom estate, the Myconian invites whole families or groups of friends to come and enjoy the top-notch luxury together. We love it for: The Collection has gourmet restaurants on site, but a private chef comes as standard! 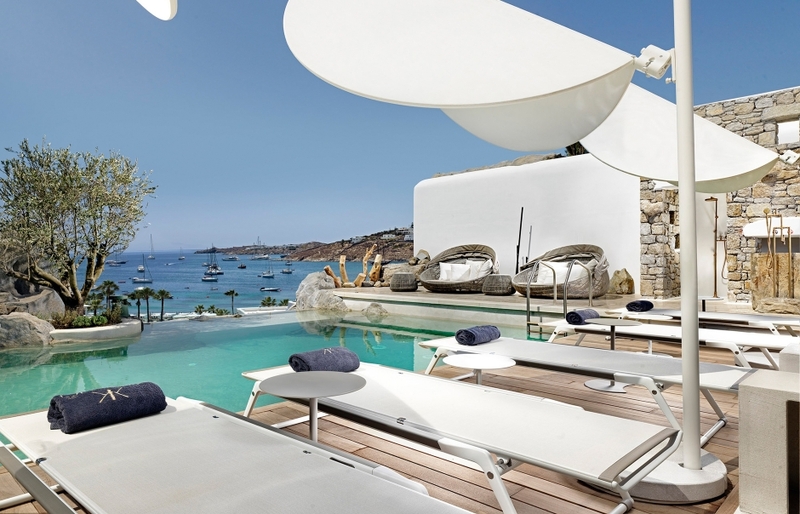 Commanding the only private beach on Mykonos, Santa Marina positions itself as an uber-luxe retreat for the clientele seeking true sanctuary from the public eye. We love it for: Panoramic sea views from their individual balconies, set in cubical buildings inspired by the local stylistic traditions. This resort is committed to delivering an exclusive, tailor-made luxury under the auspices of Relais & Chateaux. 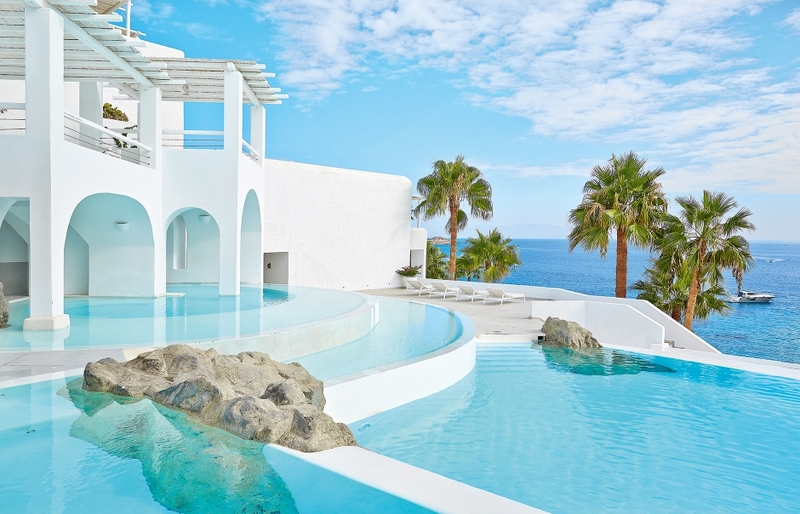 Myconian Utopia Resort combines spectacular sea views from 100 meters above Elia Beach, 5-star accommodation, luxury spa and gourmet dining, creating a sanctuary for the senses in the vibrant Mykonos. 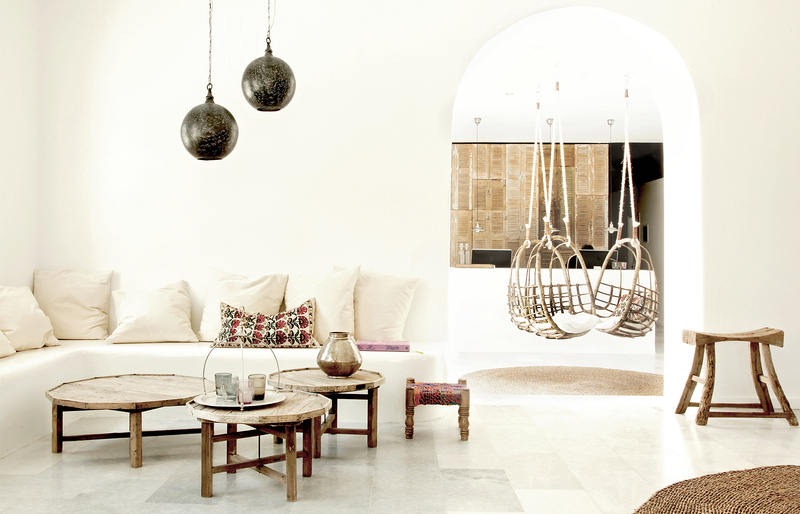 We love it for: Great interiors that fuse modern opulence with traditional craftsmanship. You can hardly wish for a more prominent location (and the view). 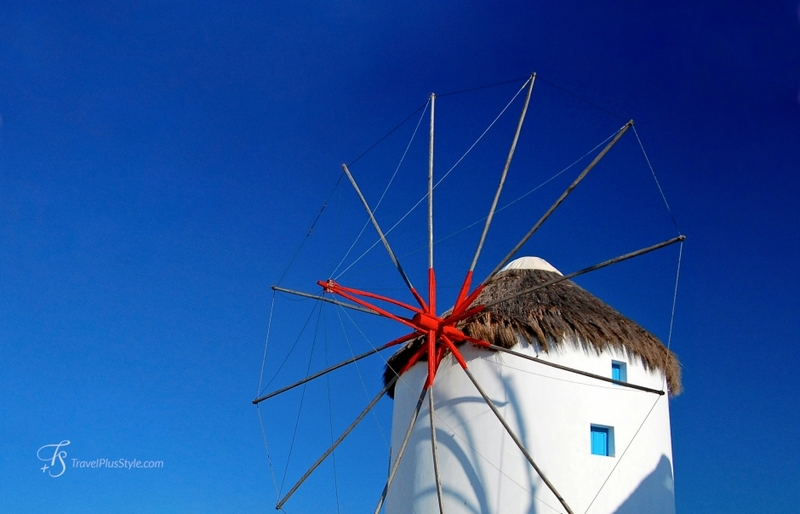 Mykonos Theoxenia neighbours the island’s famous windmills and is just across the bay from the cafes, art galleries, shops and restaurants of the Mykonos town… and of course the “Little Venice” waterfront. We love it for: 1960s glamour. This former 1960s low-rise has been transformed into a hip boutique hotel, in a triumphantly minimalist style. 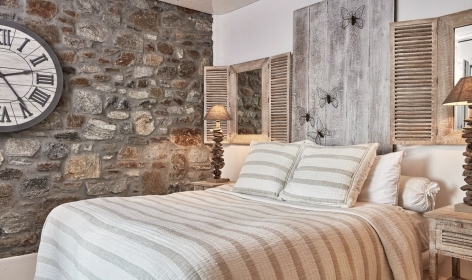 The design blends exposed stone, wood and wicker, and sets them against pristine white, with striking colour accents. This results in a fresh, energised look. 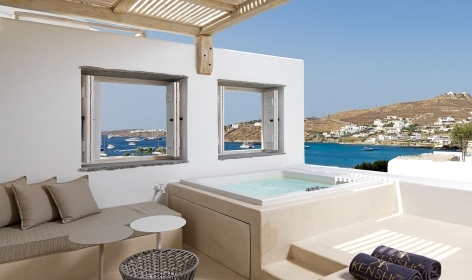 Read our review: Mykonos Theoxenia, Greece. 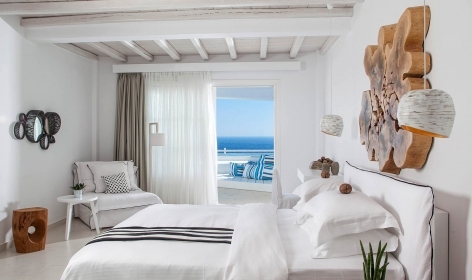 Set fifteen minutes outside of town, Pietra e Mare enchants with whitewashed stucco exteriors, sunny blue-on-white rooms, and a patch of secluded beach, sparingly dotted with loungers and umbrellas. 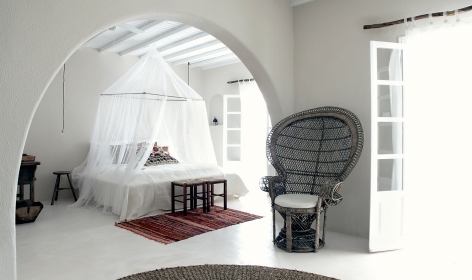 We love it for: The honeymoon suites, many of them loft-style and whiter-than-whitest interiors. 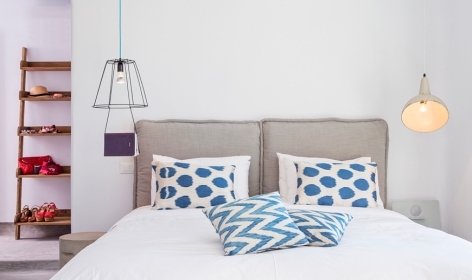 Read more: Redesigned: introducing Pietra e Mare in Mykonos. 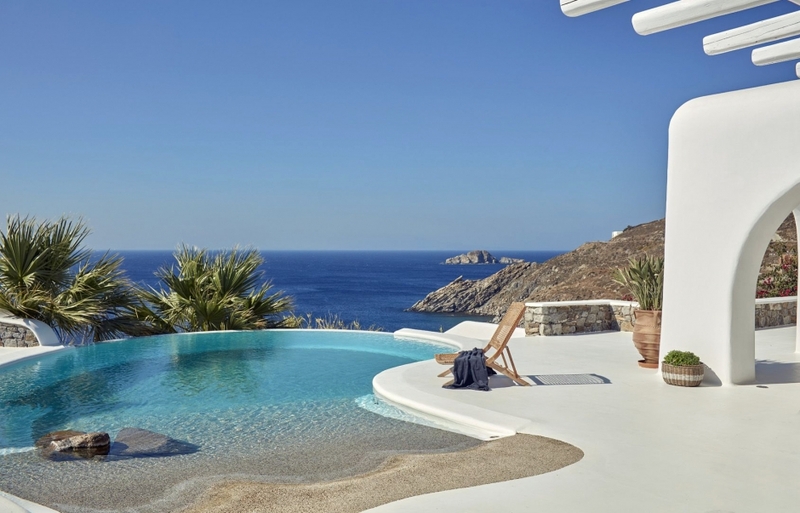 This villa-and-spa resort has a great beachfront location overlooking the Glifadi private cove in Aleomandra. The hotel’s nine elegant villas come with sea views, Jacuzzis or with a private swimming pool. 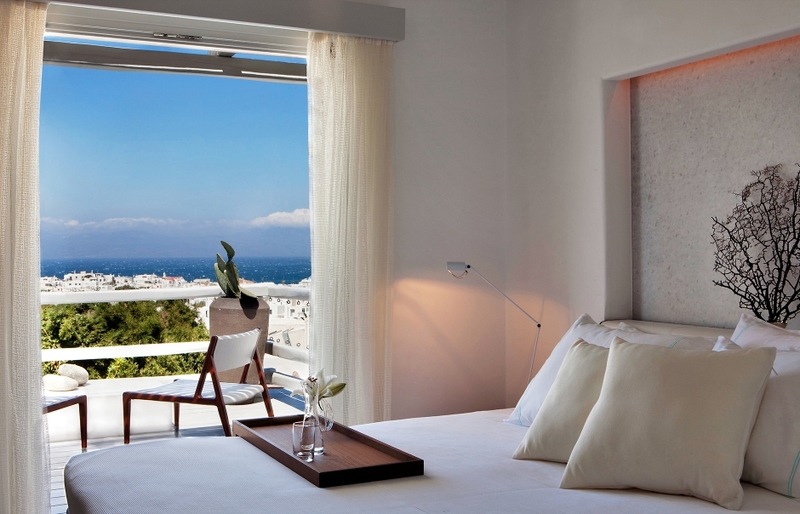 Set some three miles from the town, this is a restful base from which to explore Mykonos. We love it for: Spacious bedrooms, elegant living spaces and large private terraces with unobstructed views.